Dignity in Dementia working with Cumbria Police have developed a new free app called ‘Dementia Emergency’ it provides simple guidance on how to respond to a range of dementia emergency scenarios and is useful for emergency service personnel, family carers and others. All courses are open to men and women. Please click here for more details. Antibiotics are not recommended for most upper respiratory tract infections. Click here for more information. Most symptoms are due to your body's response to fighting infection. To help you start feeling better, you can treat your symptoms. Ask your pharmacist for advice on symptom relief. Are you currently a smoker and pregnant. Why not click here for more information about the new Quit For Two smoking cessation advice for pregnant ladies. or click here to be re-directed to the Quit For Two website. Drug, alcohol or substance misuse - Inspire can help and you can self-refer into their service by visiting their website - click here for further information. Depression Wellbeing Workshop - please click here for more information. 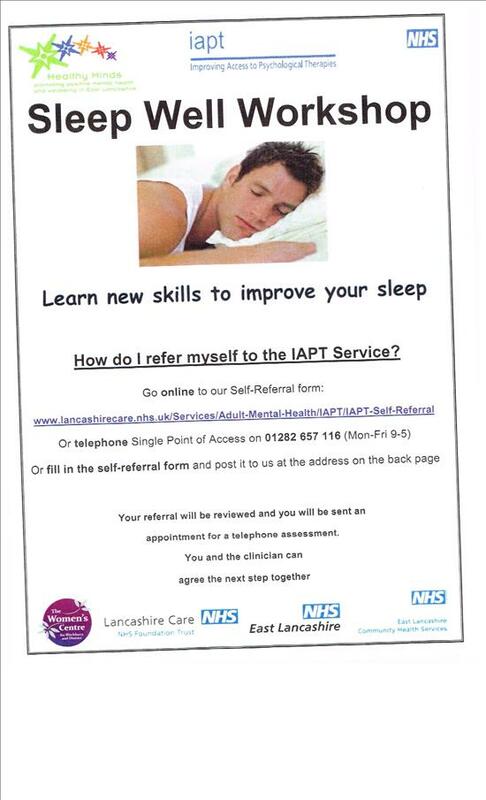 Sleep Well Workshop - please click here for more information . 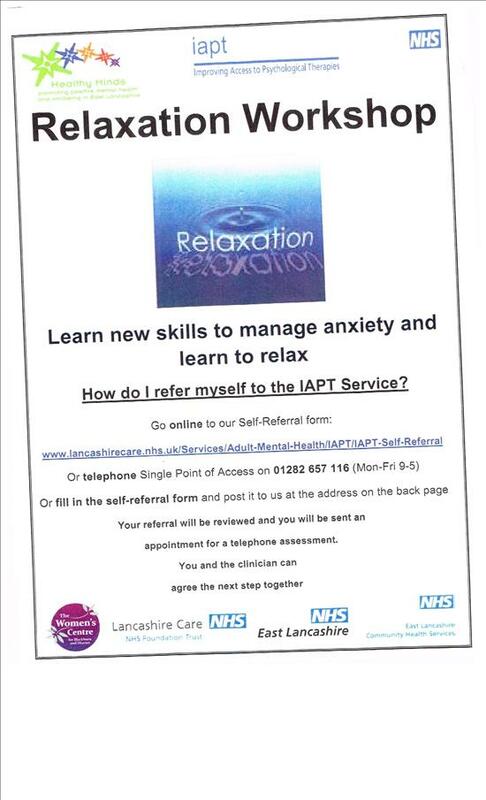 Relaxation Workshop - please click here for more information. 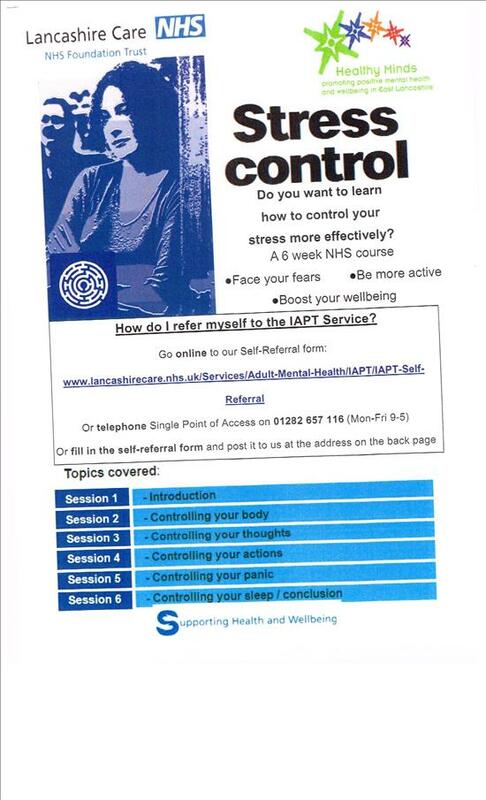 Stress Control Workshop - please click here for more information. Click here to see the Menu of Services. Click here to access the self-referral form. All of the above workshops will be available from November 2014 at the following venues:- Yarnspinners Health Centre, Nelson, Nelson Town Hall and Burnley Town Hall. Mental Health Helpline - Out of hours listening and information service for patients suffering from a range of mental health issues. Saturday/Sunday 12 noon - Midnight. Childrens Childhood Common Illnesses - pleaseclick hereformoreinformation. Please click here to visit the Meningitis Research Foundation website where you can find important information about the symptoms and signs of meningitis. Please Click Here for more self-help leaflets.